PITTSBURGH PA: Best Melting Pot Neighborhood is Pittsburgh's South Side. The best example of a melting pot neighborhood, as it always may have been, is Pittsburgh's South Side. Carson Street's arts-and-bars redevelopment bears little trace of the neighborhood's multicultural roots, but its 2000 population was multi-ethnic. Food photos are above each category. Italian restaurant link Lidia's from Yelp LINK . Food and Service is great!! Even though Greek percentage is not listed in this particular article here is the LINK to five Greek Restaurants/Market in the South Side. About 88% of the Jews in PA live in either Philadelphia or Pittsburgh. 5% of the households in Allegheny County are Jewish. Jews arrived in Pittsburgh in the 1830s and in Uniontown in the 1860s. The Jews who settle here were of various nationalities: Spanish-Portuguese, German, Russian, Hungarian, Romanian, North African and the list goes on. Pittsburgh's Squirrel Hill neighborhood is considered to be the city's primary Jewish hub since the 1920s. According to a 2002 study by the United Jewish Federation, 47% of the Jewish population live in Squirrel Hill and the surrounding area. The report states that "The stability of Squirrel Hill, a geographic hub of the Jewish community located within the city limits, is unique in North America." Squirrel Hill contains numerous Jewish day schools, synagogues, restaurants, a Community Center and an annual festival. FISH: With kosher meat not always available fish became an important staple of the Jewish diet. Gefilte fish and lox are popular. Gefilte fish was made by mincing it and mixing with finely chopped browned onions, eggs, salt, pepper, and vegetable oil. While traditionally made with carp, gefilte fish may also be made from any large fish: cod, haddock, or hake, whitefish or pike. The combination of lox (smoked salmon) or whitefish with bagels and cream cheese is a traditional breakfast or brunch in American Jewish cuisine and made famous at delicatessens. Gehakte hering (chopped herring), a popular appetizer, is made by mixing chopped herring with hard-boiled eggs, onions, apples, sugar, pepper, and a dash of vinegar. SOUPS: Chicken soup may be served with noodles, rice, or croutons. Other popular ingredients are kreplach (dumplings) and kneidlach (matzo balls or a mixture of matzo meal, eggs, water, melted fat, pepper and salt). Soups such as Borsht were considered a staple in Ukraine. Soups like krupnik were made of oatmeal, potatoes, and fat. There are a number of sour soups in the borscht category. One is kraut (cabbage) and beet borscht. BREAD AND CAKE: Challah bread, Homentash (a triangular cookie/turnover filled with fruit preserves), Mohn kihel (a cookie sprinkled with poppy seed), Pirushkes (little cakes fried with honey or molasses), Strudel and Kugels (made from rice, noodles or mashed potatoes) are popular. MEATS: Gebratenes (roasted meat) and essig fleisch (vinegar meat) are favorites. Another popular dish is Pierogi (dough filled with minced beef). A spread of chopped liver, prepared with onions is served with rye bread or crackers. Stuffed cabbage aka "cabbage roll" is also a European Jewish dish that emerged out of more impoverished times. SIDE DISHES: Tzimmes (cooked vegetables or fruits & sometimes with added meat) and Kreplach (ravioli-like dumplings filled with finely chopped, seasoned meat or cheese) are popular. SWEETS: Teiglach (marble-sized balls of dough drenched in a honey syrup) and Ingberlach (ginger candies) are popular. Jellies and preserves made from fruit juice were used as pastry filling to be served with tea. Compote (with no dairy products made of whole or pieces of fruit in sugar syrup) is a staple. Next column will be German Sects 2 - Bavaria, Moravia, Holland and Swiss. 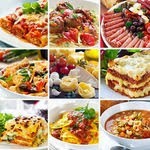 For blog posts and recipes visit www.ThePAMeltingPot.com. Christine Willard, a native of western Pennsylvania, researches and blogs about the food unique to western Pennsylvania. She currently resides in North Carolina.